As plastics and other materials degrade over the years, maintaining an efficient environment for plants, vegetables, fruit and flowers will require you to carry out repairs from time to time. Sometimes, there may be the need to purchase a new Polytunnel Cover, particularly if your existing one is damaged or ineffective. Carrying out such maintenance not only ensures the best growing conditions are kept, it helps stop pests and damage to produce from the elements too. 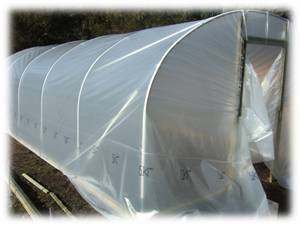 Robinson Polytunnels supply a range of polytunnel polythene for re-sheeting your polytunnel. All the polytunnel covers that we supply have a 5 year guarantee against UV degradation and manufacturing faults so you can be confident when you buy a tunnel cover from us. Not sure what size polythene cover you need? Give us a call and we will confirm the exact size to fit your polytunnel. Our experience as one of the leading manufacturers and suppliers or polytunnel plastic and accessories ensures that whatever your requirement, we have the solution for you. Providing by the metre or in larger rolls if needed, Robinson Polytunnels is the reputable name you can rely on when you need to repair or replace existing polytunnel cover. Indasol Thermal is especially formulated to reduce infra-red radiation and enhance useful light in the PAR range. It offers excellent diffusion, light transmission and superb thermic control qualities, as well as built-in anti-condensation properties which help reduce the risk of fungal diseases such as downy mildew and botrytis cinerara. Thanks to its unique additive, Indasol is able to control the condensation of water on the film. Providing the film is properly installed, water will condense uniformly on the plastic sheet rather than as droplets. This reduces the risk of water falling on to the plants below and prevents the loss of light caused by these droplets, which can account for as much as 25%. From £8.28 per linear metre . . . CLICK HERE to see prices. Its only in recent years that it has been possible to create a polythene which allows the full spectrum of natural UV daylight through. This full UV spectrum film has a dramatic effect on flower, fruit and foliage colours, particularly on the blues and reds as low levels of UV is the spectral wavelength that is required to intensify these colours. Normal films and glass block the UV below 350 nms but the range of SunMaster polythenes transmit the same full spectrum of natural UV light that plants get outside. Research has shown that natural UV levels also produce a more compact sturdier plant which is more resistant to disease. Plants root out into the pot better under SunMaster natural UV films than under conventional types of polythene. USE FOR:  All crops where colour, especially red, is important  Vegetables  Flowers  Cold over wintered crops including nursery stock. Flower growers use SunMaster UV open films to increase colour intensity of the flowers and sometimes to reduce stem length. Vegetable growers are also using SunMaster UV open films so that they can now grow red leaf salads under cover. Soft fruit growers like SunMaster UV open films because they get redder strawberry fruit with less white tips and white around the calyx . It is also said to increase flavour although this test is subjective because of individual different tastes. From £2.66 per linear metre . . . CLICK HERE to see prices. SunMaster Diffused films also have an additive which reflects part of the infra red thermal spectrum. This reflection will not only make the greenhouse up to 10% cooler than a clear film in high sunlight conditions, but also gives a much more pleasant working environment. More importantly when there is a lot of IR A/B (700-3000 nms.) it lowers leaf temperatures, reducing tip burning and reducing moisture stress on the leaf and plant. SunMaster Diffusion overall light levels are ~89% but in fact winter light levels under SunMaster diffused are considerably higher than under glass or clear polythene films. This is because the light is deflected into the structure by the diffuser, rather than being reflected off again. SunMaster diffused can give up to 2 deg C frost protection. USE FOR:  All crops where colour, especially red and blue, is important  Vegetables  Flowers  Soft Fruit  Over wintered nursery stock where only slight frost protection is required. Vegetable growers are also using SunMaster UV open films so that they can now grow red leaf salads under cover. Natural UV levels can also increase dry weight matter of certain crops. Soft fruit growers like SunMaster UV open films because they get redder strawberry fruit with less white tips and less white around the calyx. It is also said to increase flavour although this test is subjective because of individuals different tastes. Nursery Stock growers use SunMaster Diffused to give over winter protection and bring the crop to market slightly earlier than under a clear film. From £8.54 per linear metre . . . CLICK HERE to see prices. Introducing the latest technology in energy saving. Super Thermic technology is a must for any tunnel which is to be heated. Good thermal films retain 85% of the stored heat. NEW SunMaster SuperThermic retains 95% of stored heat. Thermic films allow short wave infra red from the sun to heat up the soil and contents of the tunnel. When the air temperature drops the hotter objects radiate the heat back again as long wave infra red. What a thermic film does is reflect this heat wavelength back to the ground/contents again, reducing the heat lost through the film. Until about 15 years ago a thermic film would reflect back into the structure about 65% of this heat. With the introduction of SteriLite Premium this was increased to 80-85% reflection. Now with SunMaster SuperThermic this is boosted to a massive 94-95% reflection/heat saving. Initial research is showing that this will give energy reductions of as much as 30% over a non thermic film. SunMaster Diffused films also have an additive which reflects part of the infra red thermal spectrum. This reflection will not only make the greenhouse up to 10% cooler than a clear film in high sunlight conditions, but also gives a much more pleasant working environment. More importantly when there is a lot of IR A/B (700-3000 nms) it lowers leaf temperatures, reducing tip burning and reducing moisture stress on the leaf and plant. SunMaster Diffusion reduces the overall light levels to ~ 89% but in fact winter light levels under SunMaster diffused are considerably higher than under glass or clear polythene films. This is because the light is deflected into the structure by the diffuser, rather than being reflected off again. USE FOR:  All crops which will be heated  All crops where colour, especially red and blue, is important  Vegetables  Flowers  Soft Fruit  Bedding Plants  Over wintered nursery stock where frost protection is required. Flower growers use SunMaster Diffused UV natural films to increase colour intensity of the flowers, and sometimes to reduce stem length. SunMaster diffused also reduces flower and leaf stress in strong sun conditions. Should bring forward harvest in spring and lengthen the growing season in the autumn. Soft fruit growers like SunMaster SuperThermic UV natural films because they get redder fruit with less white tips and less white around the calyx. It is also said to increase flavour although this test is subjective because of individuals personal tastes. Earliness of marketability is still to be tested. Nursery Stock growers use SunMaster Diffused to give over winter protection and bring the crop to market earlier than under a clear film. Should protect Pieris etc. from late frosts without using any heat. Bedding Plant Growers use SunMaster SuperThermic polythene to reduce energy consumption and heating costs. From £9.92 per linear metre . . . CLICK HERE to see prices. NEW Sterilite SuperThermic retains 95% of stored heat. SteriLite was the first commercially available film to block all the Ultra Violet light up to 380 nms and won the award as the best new product at the Four Oaks Trade Show in the year it was introduced. This is the opposite to the remainder of all our natural UV daylight films for some very good reasons. Aphids see in UV light, so if you remove it they cant fly. They might enter the greenhouse but they wont colonise it, as they do with ordinary films. Botrytis and Mildew are very short lived and also need UV light to keep renewing themselves. Take the UV away and they struggle to survive. This also helps increase post harvest storage as there are less viable spores on the crop. This is known as Photological control and you dont have to use any chemicals so SteriLite is ideal for organic growers. SteriLite Diffused films also have an additive which reflects part of the infra red thermal spectrum. This reflection will not only make the greenhouse up to 10% cooler than a clear film in high sunlight conditions, but also gives a much more pleasant working environment. More importantly when there is a lot of IR A/B it lowers leaf temperatures, reducing tip burning and reducing moisture stress on the leaf and plant. SteriLite Diffusion reduces the overall light levels by about 1% but in fact winter light levels under SteriLite diffused are considerably higher than under glass or clear polythene films. This is because the light is deflected into the structure by the diffuser, rather than being reflected off again. SteriLite can save up to 15% of your heating costs and give up to 5 deg C frost protection without heat. USE FOR:  All crops which will be heated  Vegetables  Flowers  Organic Soft Fruit  Nursery Stock  Late in the year or early crops. Flower growers who have problems with disease prefer SteriLite film. If they have problems with short stems SteriLite will also increase stem length. Vegetable and Salad Leaf growers also use SteriLite because the effect of giving less UV increases the foliage area and the high thermic effect means that crops can be grown both earlier and later in the year than under lower or non thermic films. Soft fruit growers use SteriLite if they wish to use organic methods or if they have a problem with mildew or aphids, and the highly thermic effect helps in the earliness of harvest. Bedding Plant growers like SteriLite for control of Botrytis and for the reduction in heating costs or frost protection. Nursery Stock growers use SteriLite to reduce disease and bring the crop to market at least a month earlier than non thermic films. Anti Hot Spot Tape and Repair Tape is available on our Tapes for Polythene Page.